↑ 1.0 1.1 1.2 John Pollard (1998年12月). "Mussolini's Rivals: The Limits of the Personality Cult in Fascist Italy". New Perspective (用英文寫). 4 (2). ↑ 2.0 2.1 Manhattan, Avro (1949年) [1949年]. "Chapter 9: Italy, the Vatican and Fascism". The Vatican in World Politics (用英文寫). C.A. Watts & Co., Limited, London. 喺2008年4月9號搵到. ↑ Tom Behan. "Features: The resistible rise of Benito Mussolini and Italy's fascists" (用英文寫). （原先內容喺2008年5月2號歸檔）. 喺2008年4月9號搵到. ↑ 4.0 4.1 4.2 4.3 "Chapter 2: Italy under Fascism". Living History 2 (用英文寫). ISBN 1-84536-028-1. ↑ Alfred Armstrong (2008年1月19號). "The Cardinal's Mistress" (用英文寫). Old Books. 喺2008年4月4號搵到. ↑ "A History of Italy in Breif" (用英文寫). Life In Italy. 喺2008年7月8號搵到. ↑ andry. "Second Italo - Abyssinian War 1935-1936" (用英文寫). WAR CHAT- War News and History. （原先內容喺2008年9月27號歸檔）. 喺2008年7月8號搵到. ↑ "Second Italo-Abyssinian War 1935-1936" (用英文寫). OnWar.com. 喺2008年7月8號搵到. ↑ Bernard Bridel (2003年8月13號). "Les ambulances à Croix-Rouge du CICR sous les gaz en Ethiopie" (用法文寫). Le Temps. 喺2008年7月8號搵到. ↑ "Records of the Foreign Service Posts of the Department of State (RG 84)" (用英文寫). The US National Archives and Records Administration. 喺2008年5月14號搵到. ↑ "Franco-Czech Treaty" (用英文寫). TIME. 1924年1月7號. 喺2008年4月28號搵到. ↑ Lawrence Jorgensen. "From Intervention to Munich" (用英文寫). Millenial Files. （原先內容喺2008年5月2號歸檔）. 喺2008年4月28號搵到. ↑ Kurt Kuhlmann (1992年10月6號). ""Submit to a Humiliation" The Military Considerations of British Czechoslovakian Policy in 1938" (用英文寫). Warhorse Simulations. 喺2008年4月28號搵到. ↑ "Munich Agreement" (用英文寫). Ministry of Foreign Affairs Czech Republic. 喺2008年4月29號搵到. ↑ "The Munich Agreement and its Application" (用英文寫). ibiblio.org. 喺2008年4月29號搵到. ↑ 17.0 17.1 "Albania - Italian Occupation" (用英文寫). US Library of Congress. 喺2008年5月6號搵到. ↑ 18.0 18.1 18.2 "The Italian Invasion of Albania (1939)" (用英文寫). The Frosina Information Network. （原先內容喺2008年4月23號歸檔）. 喺2008年5月6號搵到. ↑ "1939: Germany invades Poland" (用英文寫). 英國廣播公司. 喺2008年4月18號搵到. ↑ "1939: Britain and France declare war on Germany" (用英文寫). BBC. 喺2008年4月18號搵到. ↑ "Australia at war 3 September 1939" (用英文寫). Australian Government Department of Veterans' Affairs. 1939年9月3號. 喺2008年4月29號搵到. ↑ 22.0 22.1 22.2 22.3 "ITALY and the ITALIAN CAMPAIGN 1943 -1945, including Sicily, Salerno & Anzio Landings" (用英文寫). NAVAL-HISTORY.NET. 喺2008年4月18號搵到. ↑ "MUSSOLINI'S WAR STATEMENT" (用英文寫). ibiblio.org. 喺2008年4月19號搵到. ↑ "1941: Germany and Italy declare war on US" (用英文寫). BBC. 喺2008年4月19號搵到. ↑ "THE GERMAN DECLARATION OF WAR WITH THE UNITED STATES" (用英文寫). ibiblio.org. 1941年12月11號. 喺2008年4月29號搵到. ↑ "US Declaration of War Against Germany" (用英文寫). US Diplomatic Mission to Germany. 喺2008年4月29號搵到. ↑ "DECLARATIONS OF A STATE OF WAR WITH JAPAN, GERMANY, AND ITALY" (用英文寫). ibiblio.org. 喺2008年4月29號搵到. ↑ 28.0 28.1 28.2 Josephine Cowdery (2007年). "BENITO MUSSOLINI AND HIS SURVIVORS" (用英文寫). USM Books. 喺2008年4月19號搵到. ↑ Victor Matus. "On the Disposal of Dictators" (用英文寫). Hoover Institution. 喺2008年7月9號搵到. ↑ 31.0 31.1 Richard Owen (2005年1月13號). 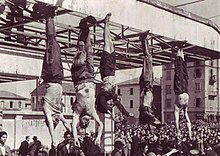 "Power-mad Mussolini sacrificed wife and sons" (用英文寫). The Times. 喺2008年4月4號搵到. 陳祥超. "意大利法西斯主義嘅理論構成及其淵源" (用中文寫). 中國社會科學院世界歷史研究所世界歷史數字化研究部. 喺2008年4月12號搵到. "Statuto del PNF" (用義大利文寫). 1938年. 喺2008年4月12號搵到. Margherita G. Sarfatti. 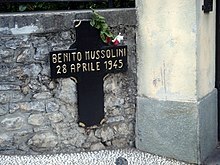 The Life Of Benito Mussolini (PDF/txt) (用英文寫). 由Frederic Whyte翻譯. Frederick A. Stokes Company. 喺2008年4月7號搵到.